Step back metal braces; there’s a new cosmetic solution in town. Invisalign aligners took patients by storm when they were initially released several years ago. 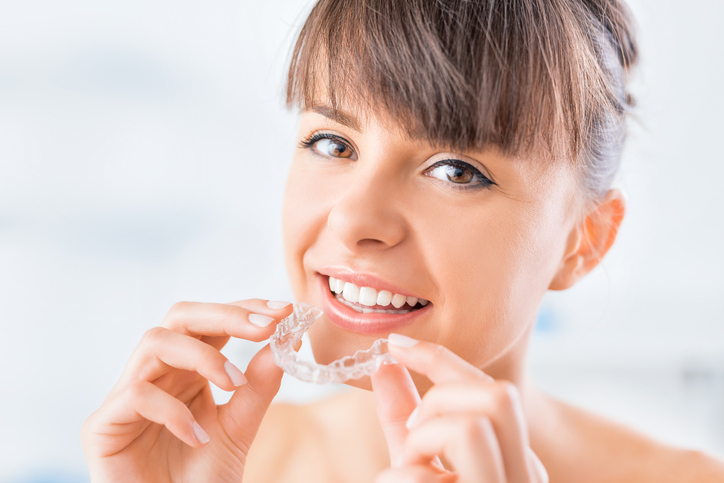 As a way to get straight teeth without having to wear metal braces, Invisalign aligners are one of the most popular procedures among our patients at Blue water Dental of St. John’s. If you are considering Invisalign but still aren’t sure exactly what they are, we have created a brief article listing three unique things about them. If you aren’t familiar with how Invisalign works, then you may be surprised to know that you will switch your aligners out every two weeks. By switching out your aligners every two weeks, they work to slowly push your teeth toward the perfect position. Each customized aliner gets you one step closer to your perfect smile. Although you are supposed to wear your Invisalign trays for a total of 20-22 hours every day, one of the biggest benefits of them is that you can take them out to eat, drink, or even brush your teeth; which makes them a much more comfortable and functional alternative to traditional metal braces. Atlhgouhg Invisalign cnan trat a vairety of comsetic issues like crowded teeth, crossbites, overbites, underbites, and gaps between teeth, it can’t fix extreme jaw and misalignment issues. During Your initial consultation with Dr. David Sorenson, he will be able to better determienwhehter or not you are a suitable candidate for Invisalign. Now that you know a little bit more about Invisalign, it’s time to schedule your consultation. Call our Ponte Vedra office today at (904) 395-7771.